Cape Town - South Africa’s convenor of selectors Andrew Hudson said on Thursday that omitted leg-spinner Imran Tahir remained part of their future Test plans. Tahir was on Thursday left out of the Proteas’ Test squad for the upcoming home series against New Zealand, leaving many to think the Pakistan-born spinner’s days at international level are numbered. Tahir had a disastrous recent series in Australia, where he conceded 260 runs without taking a wicket in the second Test in Adelaide. He was subsequently dropped for the final Test in Perth when the Proteas clinched the series 1-0. 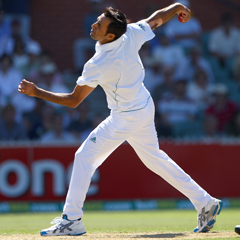 His replacement, Robin Peterson, took six vital wickets to help South Africa win by 309 runs. Peterson was on Thursday named as the frontline spinner for the two-Test New Zealand series, which starts at Newlands on January 2. However, Hudson explained that all is not lost for the 33-year-old Tahir. "It was a tough call to leave out Imran Tahir but we have to acknowledge that Robin Peterson put up an outstanding performance at Perth where he made a significant contribution to our victory. Imran remains very much in our plans going forward,” he told SAPA. The Proteas play thee T20 games, two Tests and three ODI against the Kiwis. Proteas Test squad: Graeme Smith (captain), Hashim Amla, AB de Villiers, Faf du Plessis, Dean Elgar, Jacques Kallis, Rory Kleinveldt, Morne Morkel, Alviro Petersen, Robin Peterson, Vernon Philander, Jacques Rudolph, Dale Steyn. Proteas T20 squad: Faf du Plessis (captain), Farhaan Behardien, Henry David, Quinton de Kock, AB de Villiers, Rory Kleinveldt, Richard Levi, David Miller, Morne Morkel, Chris Morris, Wayne Parnell, Robin Peterson, Aaron Phangiso, Dale Steyn, Lonwabo Tsotsobe.